Today's post is a recipe courtesy of two wonderful bloggers. 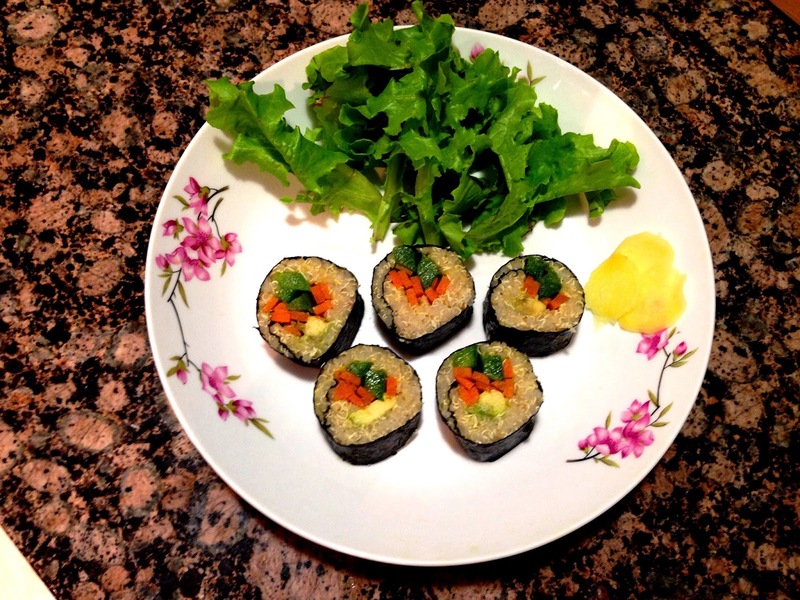 These creative quinoa sushi rolls were originally made by the thoughtful and imaginative Gena of Choosing Raw - her blog which focuses on healthy and delicious vegan foods as well as insights on having a harmonious view of food, exercise and body, and on veganism as a caring lifestyle. She has been inspiring me for quite some time now, and if you haven't checked out her blog already I would highly recommend it! You can find the recipe here as shared by the Rika of Vegan Miam - her blog on vegan recipes and travel. She has traveled to so many places, and she definitely allows her many experiences to shine in her amazing recipe collection full of diverse and yummy-looking recipes, please check out her blog as well! I pretty much followed Gena's basic recipe, with a few substitutions - I didn't have asparagus so I used some lightly sautéed carrot and green pepper slices instead, and I omitted the mirin/sweetener since I don't yet have any liquid sweeteners in the house. I had them with a little homemade pickled ginger, which was quite easy to make - all I did was to thinly slice some fresh ginger and marinate it with a little salt and some vinegar (I would also recommend adding a small bit of maple syrup or other sweetener if you have it). These sushi rolls were so delicious! 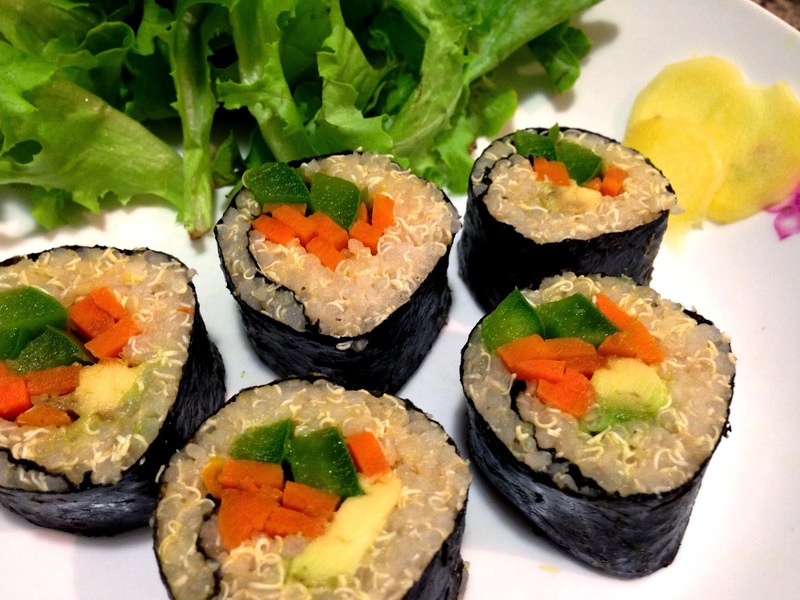 The quinoa filling rolls and holds together really well, and provides an extra boost of plant protein, iron, and B-vitamins to the sushi rolls! They make a very portable packed lunch or dinner, and I would also recommend them as an enjoyable activity to make with friends or family - it is quite fun to try spreading out the quinoa and fillings, and rolling and cutting up the sushi rolls together. Congratulations on moving in! 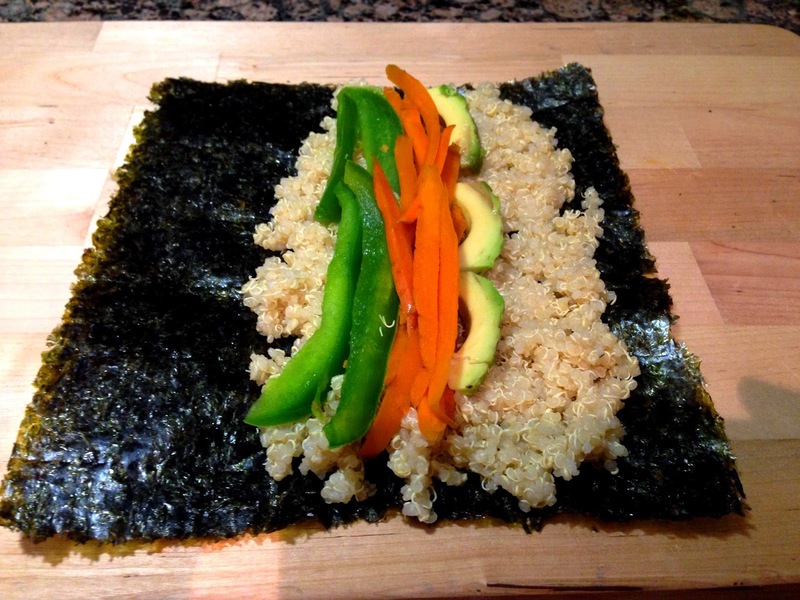 Awww thank you Sarah for the lovely mention, Gena’s quinoa sushi is pretty tasty and I like your substitutions, too…homemade pickled ginger?! I’m so in! Have a wonderful Sunday! Thank you Rika! My sister just arrived yesterday, so I am so excited for us to start this new adventure together! :) I hope you had a lovely weekend as well!